Enter, pay, go to the second floor of the McCord Museum on Sherbrooke Street in Montreal, and be amazed. 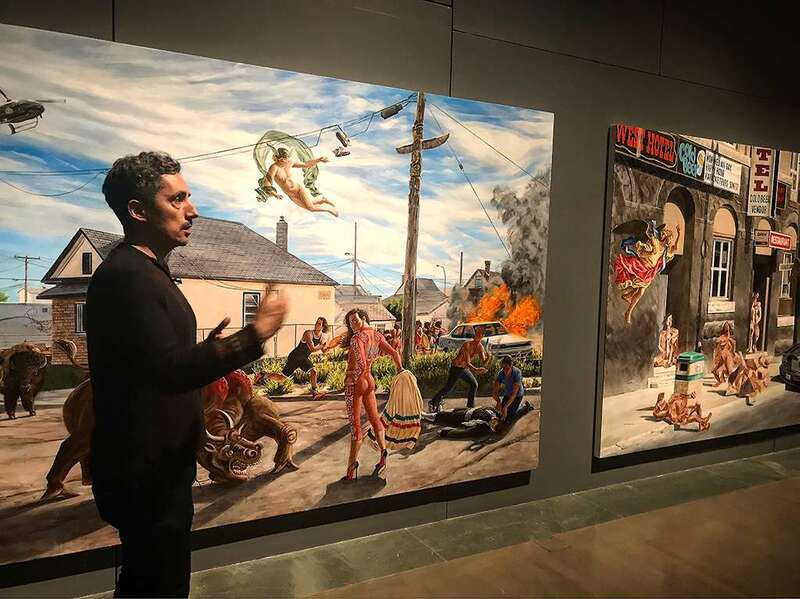 Cree artist Kent Monkman’s Shame and Prejudice: A Story of Resilience is a nine-chapter history of Canada told in painting, sculpture and other artistic forms that will leave visitors with a very different and complex history of Canada. 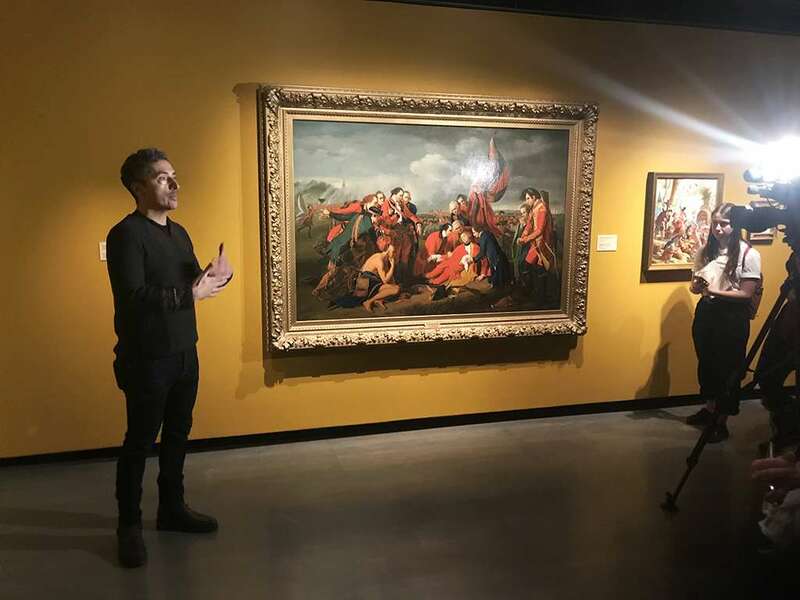 The Eastern Door and other media took a tour of the exhibit with Monkman, who explained his process, work, inspiration and intent behind the show. Through his titular character Miss Chief Eagle Testickle, Monkman responds to colonial history and sexuality in the various work. She, for example, sits on an iconic Hudson’s Bay blanket naked but for a pair of designer heels before the “fathers of confederation” in a painting called “Daddies” at the beginning of the show. She appears throughout the nine time periods that go from colonization to confederation to residential schools to the modern streets of Winnipeg’s North End. A memoire of Miss Chief Eagle Testickle is forthcoming from Monkman. Each room brings comedy, tragedy, style and pain. Monkman’s huge and brilliant painting “the Scream,” for example, depicts RCMP officers in full red uniforms snatching children from their homes to bring them to residential schools. 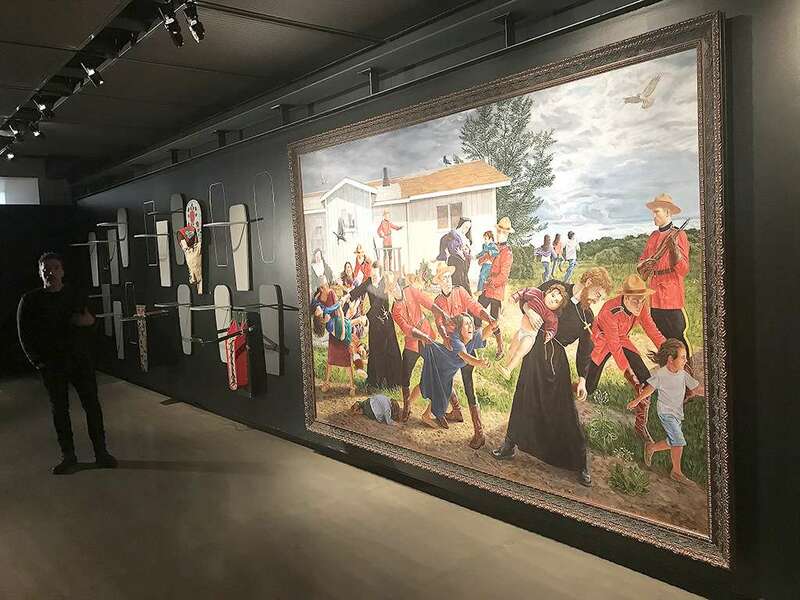 Surrounding the painting are cradleboards – some complete, some begun and some absent – hitting home the devastating reminder of those young ones lost or left changed forever by the Canadian government’s genocidal policy. Monkman includes contemporary and historic work to complement his own, which set the historic chapters. The show has been touring Canada for two years and hosted at nine venues. The show was conceived in the lead-up to 2017 and the country’s 150th anniversary celebrations. “This exhibition is my response to the Canada 150. It’s a critical eye on the colonial period, which really was 150 years since the signing of the treaties and confederation,” said Monkman. Monkman worked with the McCord and a dozen museums across the country (“colonial art spaces” as he calls them), as he’s done in the past, and dug up materials, resources, and other objects, and as curator and artist, created the show. The show runs until May 5, and is the first of a year’s worth of shows featuring Onkwehón:we artists. Kanien’kehá:ka multidisciplinary visual artist Hannah Claus’s work will open March 7.